Receive 20% savings as a statement credit after using your card on eligible Delta in-flight purchases. Terms apply. Whether you are already a loyal Delta Airlines client or not, the Blue Delta SkyMiles® Credit Card From American Express holds some solid rewards. Every dollar you spend directly with Delta – in-flight and online – and at U.S. restaurants, will result in you receiving 2 miles. You’ll earn 1 mile per dollar spent on other purchases. You can also earn 10,000 bonus miles when you spend at least $500 during your first three months as a cardholder. You can redeem these rewards either on a Delta flight or at one of its more than 15 in-air partners. Note that Delta flights will never have blackout dates, though its partners may. When you are flying with Delta, you can save 20% off your purchases of in-flight food and drinks made with the Blue Delta SkyMiles® Credit Card from American Express. That discount will be returned to you in the form of a statement credit. Flying a specific amount of miles and spending a certain amount of money on those flights could qualify you for Delta’s prestigious Medallion status, affording you even more benefits. Perhaps best of all, there’s no annual fee for the Blue Delta SkyMiles® Credit Card from American Express. Cardholders can expect their APR to fall between 17.99% - 26.99% Variable, depending on their credit score and history. However, if you make a late or returned payment, you could be charged a 29.99% variable penalty APR. That’s something to keep in mind if you’ve had issues with late payments in the past. 10,000-mile sign-up bonus - If you spend at least $500 in purchases during your first three months as a cardholder, you’ll receive 10,000 bonus miles towards your account. 2 miles on Delta and dining purchases - Every dollar you spend with either Delta Airlines -- in-flight and online -- or at restaurants in the U.S. will earn you 2 miles. All other everyday purchases of gas, groceries and more will earn 1 mile per dollar spent. Smart Tip - There’s no limit to the amount of miles you can earn as a cardholder, so hold onto your rewards until you need them most. Rewards for your miles - Redeem your mileage earnings directly on Delta flights and other benefits, as well as offerings from its more than 15 airline partners. There are no blackout dates on any Delta flights, though airline partners may have blackout dates. No annual fee - There’s no yearly charge to remain a cardholder of the Blue Delta SkyMiles® Credit Card From American Express. Save money on in-flight buys - Receive 20% savings in the form of a statement credit on eligible purchases made in-flight with Delta. This may include purchases of food, beverages, and audio sets. Please see terms for additional details. Gain Medallion status - Medallion members receive extra perks from Delta Airlines depending on which level of the program they qualify for. This will be determined by how many total miles or segments you fly with Delta and its airline partners, as well as how much you spend on those flights. The second qualification can be waived if you spend $25,000 or more during the calendar year. Silver level - Benefits include 7 miles per dollar spent with Delta, waived baggage fees, 1,000 bonus miles for renting with Hertz® and more. You can qualify for this by flying a total of 25,000 miles, or 30 segments, and spending $3,000 on those flights. Gold level - Benefits include 8 miles per dollar spent with Delta, Sky Priority boarding, priority baggage handling and more. You can qualify for this by flying a total of 50,000 miles, or 60 segments, and spending $6,000 on those flights. Platinum level - Benefits include 9 miles per dollar spent with Delta, unlimited free first class upgrades up to 5 days before departure and more. You can qualify for this by flying a total of 75,000 miles, or 100 segments, and spending $9,000 on those flights. Diamond level - Benefits include 11 miles per dollar spent with Delta, admission to the Delta Sky Club® and more. You can qualify for this by flying a total of 125,000 miles, or 140 segments, and spending $15,000 on those flights. Global Assist® hotline - Cardholders traveling 100 miles or more from their homes can call this hotline and receive emergency medical, legal and financial aid. However, any charges incurred from the use of this service will be charged to the cardholder. Lowest hotel rates guarantee - If you book a room through Amex, and then find it somewhere else cheaper in the exact specifications of your original purchase, you’ll be refunded the difference. Car rental damage insurance - Reserving and paying for a car rental with your Blue Delta SkyMiles® Credit Card From American Express will get you coverage for any theft or damage done to the vehicle. Simply decline the rental company’s insurance and you’ll become eligible for this. Amex® cardholder mobile app - You’ll constantly be able to keep track of the most current information related to your Blue Delta SkyMiles® Credit Card through its mobile app. 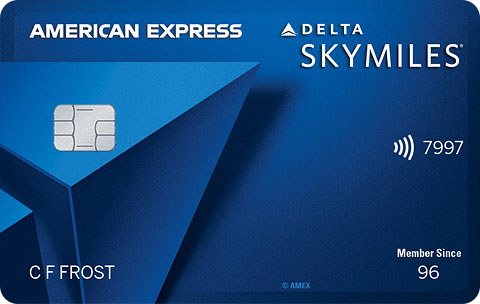 An already loyal Delta Airlines flier stands to gain significantly from being a Blue Delta SkyMiles® Credit Card From American Express cardholder. The best mileage-earning rate is on purchases with Delta, so if you already find yourself booking Delta flights frequently and you tend to spend on those flights, having this card in your wallet could earn you some serious savings. If you’re not necessarily loyal to Delta but you’re a frequent traveler, you can still benefit from the Blue Delta SkyMiles® Credit Card From American Express, as there are more than 15 airline partners in the redemption network. 17.99% - 26.99% Variable, based on your creditworthiness. 29.99% Variable. This APR may be applied to new transactions on your account if you make one or more late payments or your payment is returned by your bank. If the penalty APR is applied, it will apply for at least six months. Your due date is at least 25 days after the close of each billing period. You won’t be charged interest if you pay the full balance on time each month. Cash Advance Fee Either $5 or 3% of the amount of each cash advance, whichever is greater. The Blue Delta SkyMiles® Credit Card From American Express offers cardholders a solid rewards program with quite a few extra perks. But how does it compare to one of the stalwarts of the travel rewards market, the Bank of America® Travel Rewards credit card? Instead of the 2-miles and 1-mile rates offered with the Delta Card, the Bank of America® Travel Rewards credit card offers a flat 1.5 points rate on all purchases, regardless of category. While someone making very consistent Delta purchases might outearn that rate, chances are the Bank of America® Travel Rewards credit card has the better reward earning rate locked up. Its sign-up point bonus is also more than double that of the Delta Card’s 10,000 miles, though you have to spend double the money in the same 90-day period to do so. Both cards offer no annual fee and similar variable APR ranges, but the Bank of America® Travel Rewards credit card has the Delta Card beat with its 0% introductory purchase APR for your first 12 billing cycles. This will give an extraordinary amount of freedom to cardholders during their first year with the card -- something Delta just can’t match. Bank of America® also takes home the redemption options win, as its rewards can be redeemed for not only flights, but also hotel stays, rental cars and other travel costs. You can earn great rewards by spending on Delta and restaurant purchases with the Blue Delta SkyMiles® Credit Card From American Express. If you’re a loyal Delta customer, you may want to strongly consider adding this card to your wallet. But if you’re looking for any airline credit card and aren’t yet loyal to one brand, there are better options out there, like The JetBlue Plus Card. This isn’t to say that the Delta Card doesn’t provide a substantial mileage and redemption program, because it does. However, unless you’re really attached to Delta Airlines, there might be better choices for you.